You are here: Home / Advertising / Kidney Stones In Kindergarten? 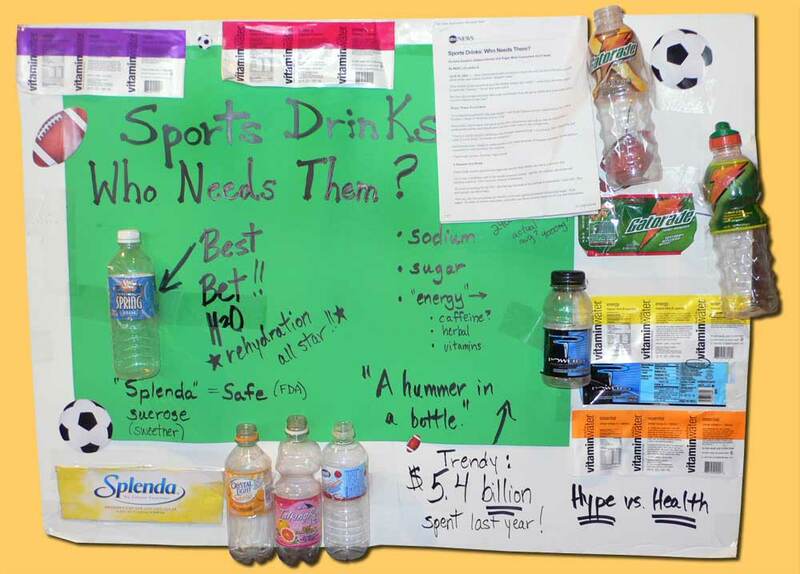 Put Down the Sports Drink, Kiddo! Today’s New York Times reports “A Rise in Kidney Stones Seen in U.S. Children,” naming high sodium intake of processed foods as one of the culprits, sending wee ones into urology clinics (no pun intended). Ever since the multimillion dollar marketing blitz sanctifying sports drinks as a ‘better for you’ beverage I’ve watched kids chug down those colossal sized jugs of neon joy juice on playgrounds all over the country. Not that there’s much ‘play’ on the grounds, since ‘running and tag’ are ‘off-limits’ half the time due to liability issues and any gear remotely tied to potential injury or a hint of sweat is usually removed after any exertion especially if junior lands on his keister and it’s all deemed ‘too dangerous’ (don’t get me started). You certainly don’t have to be an MD or the NIH to see this coming down the pike: increased food marketing to kids + decreased activity and a heavy seepage of salt into the entire food supply? Hmn. Harvard Medical School’s Dr. Caleb Nelson, who is also co-director of the new kidney stone center at Children’s Hospital Boston reports that kids as young as 5 or 6 are being treated for what used to be a middle-aged disease, and now the median age of children with stones is about 10. Just ducky. Maybe all the fresh press coming out will give the issue the added media ‘umpf’ to get food marketers and industry suppliers to see the kidney stone causes linked to the ‘Appetite for Profit’ and see how it’s taking its toll on children. 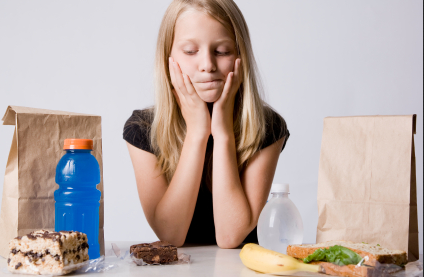 After all, any playground volunteer watching the sacks of chips, snack packs and highly processed lunch foods pulled out at noon-time, or even a tame-looking Thermos of soup (which often has 50% of a child’s daily sodium intake in one can) will attest to the high salt trend embedded deep within the lifestyle habits and food chain. That’s even before you add on the chug-a-lug athlete-wannabe coolness caché heavily promoted by marketers as a ‘healthier’ alternative to soda. We demo additives in sports and energy drinks via our ‘sim city’ simulation of unhealthy outcomes, and deconstruct the new items coming our way as fast as we can, challenging kids to ‘hunt’ for hidden clues of salt that are just as apt to be in their breakfast cereal…or salad dressing as in a bag of chips. Our ‘train the trainer’ games that we’re turning into open source, short sheet downloads use fun, simple games like ‘Beverage Bingo’ and ‘Order Out’ using a desk service bell to ‘ding them out’ of the game as they choose their food from faux menus and hit their DV/sodium max. Since restaurant foods often carry 75-80% of a day’s supply of sodium right off the bat their choices become clear REALLY fast. Ding! game over! You just used all your DV in one breakfast drive through! Or Ding! Soccer practice with those pouch packs and sports drinks just slammed your system; bland dinner for you! It’s really quite a hoot, since once kids get the hang of it and start seeing how pervasive salt is, they see that it turns up everywhere and start educating their parents in kid-empowerment to influence the purchase power in a positive way. 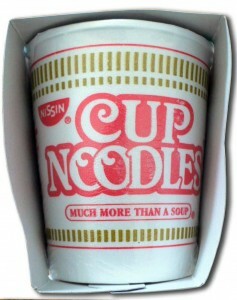 To be fair, moderate amounts of sodium are NEEDED to balance water and minerals and help muscles and nerves work properly, but when fast foods, snack foods, and highly processed foods (canned, frozen, boxed, or bagged) become kids’ major intake instead of fresh, whole foods, sodium is bound to bump up to high levels WITHOUT adding a hydration fluid packed with same into the marketing mix. This is not rocket science, folks. I have to remind ALL that SODIUM is usually the number one swap-out additive that’s used to replace the flavor in fat free, reduced fat, and low fat items…So heads up! Kids can end up with TRIPLE the amount of sodium intake recommended. And? The development of a high salt preference in taste buds…And? An increased chance of hypertension, heart disease, stroke…And? Pediatric kidney stones. Center for Science in the Public Interest (CSPI)) has red-flagged this for ages, (see sample sodium levels in kids food menus here) and Shaping Youth has been testing tactics like mad to see ‘what sticks’ in the persuasive peer power mindset…But I’ll admit, the ‘kidney stones in kindergarten’ development even surprised me. I never thought it would go ‘this far this fast,’ harming children’s bodies unchecked. The NYT article also mentions evidence that sucrose, found in sodas, can also increase the risk of kidney stones, as can high-protein weight-loss diets, which are growing in popularity among teenagers. sigh. Sheesh! It’s no wonder the AMA is recommending that the FDA change the status of salt as ‘safe’ and develop regulatory measures to limit sodium in processed and restaurant foods. For starters, figure out ages and stages to be informed of your intake. How much sodium is “ok” for a 9-13 year preteen child to consume? And before we hit the holiday food prep season, you might want to peek at CSPI’s 29 pp. pdf called “Salt Assault” which lists brand name comparisons of foods in different categories. Handy. If you want to give counter-marketing a go, frankly, the food itself does the talking!! I mentioned in my post, “Sugar and soda falter, now caffeine and sodium rule” how we’re ‘swapping out’ toxins by marketing dangerous doses to kids whose developing bodies should NOT be ingesting these high levels of additives, much less in concentrated concoctions that they’re slurping down as ‘healthy’ perceptions on the playing field. 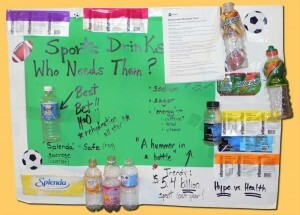 We have kids create posters and keep track of their intake of “media, munchies, and meals” for just ONE week to observe the correlations and initiate the dialog about getting wise to what’s being marketed, and the ‘junk in, junk out’ concept, so they begin to acquire the enlightened, ‘sports drinks, who needs ’em?’ attitude to share their new knowledge with peers. Hey, toss in a few smooth stones to mimic crystallized oxalate/calcium, kidney stones, clink! clink! Shaping Youth Full Disclosure: I’ll be transparent and say, we purposely use dramatization as part of our counter-marketing to ‘drive the point home’ to kids, reinforcing natural vs. chemical, whole foods over processed, etc. and are huge fans of CSPI, so with that in mind, here’s an example of a simple item deconstruction. Ingredients: High Fructose Corn Syrup, Maltodextrin, Citric acid, Natural flavors, salt, potassium citrate, modified food starch, coconut oil, potassium phosphate, sucrose acetate isobutyrate, blue 1. High Fructose Corn Syrup: Corn syrup treated with enzymes to make it sweeter (about 1.5 times as sweet as sugar). It is a combination of fructose and dextrose and is low cost. Maltodextrin: Obtained by hydrolysis of starch. Combo of maltol and dextrin. Fewer calories than sucrose, safe. Citric acid: Obtained from citrus fruit by fermenting of crude sugars. The most widely used acid in the cosmetics industry, it is also used to neutralize lye during the process of peeling vegetables, an adjuster of acidity and alkalinity, used to cure meats, firm up certain vegetables and prevent off tastes in fried potatoes. Also used to remove trace metals and brighten commercial products, as well as dissolve urinary bladder stones. Salt: Can adversely affect people with high blood pressure or kidney disease. May contribute to osteoporosis: One report shows that a high salt diet does reduce bone density in girls. Potassium citrate: A urinary alkalizer and gastric antacid. Used as a buffer in confections and artificially sweetened jellies. Modified food starch: Ordinary starch that has been chemically altered to modify thickening and jelling properties. Babies have difficulty digesting starch in its original form, but modified food starch is used widely in baby food based on the theory that it is easier to digest. It is modified with many extremely dangerous and toxic chemicals, so safety questions have arisen. On top of the FDA’s list to reevaluate since 1980 but no progress has been made. Potassium phosphate: Used as a color preservative and in the brewing industry as a yeast food in the production of champagne, a urinary acidifier. Blue 1 aka Brilliant Blue FCF: It has previously been banned in Austria, Belgium, Denmark, France, Germany, Greece, Italy, Norway, Spain, Sweden, and Switzerland among others but has been certified as a safe food additive in the EU and is today unbanned in most of the countries. 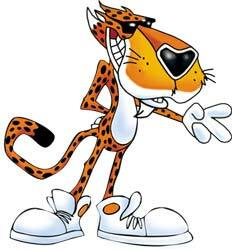 In the United States production exceeds 1 million pounds annually, and daily consumption is around 16 mg per person. Debra, I just read your article above, and will excerpt your take on it for our readers, as it’s an important one to consider for certain!! Since I’m not an RD like you are (or Rebecca is!) I’m using what research/knowledge I have, but let me tell you, I’m going to dig into “phosphoric acid colas” and Google it big time, (and send it to Rebecca to see if she can enlighten me!) for what you’ve presented here certainly makes solid sense! Millions of pounds of this tainted powdered milk has been imported into the USA and that doesn’t include products made in China. Food manufacturers didn’t want to throw away this poison laced milk powder so they used it. The FDA has given companies the green light to put this poison into our food, but recommends not adding it to baby formula. The FDA is also withholding what products are poisoned. So the large increase in kidney stones being found in U.S. children is an intentional act by Major corporations and the FDA. It’s not salt or global warming. You and your children are being poisoned in the name of profit! Abram, thanks for the links…Marion Nestle is fabulous, and I just wanted to toss out the actual verbiage into the comment section since it’s so impt. for people to hear. So, yes…your points are well taken…Profiteering over public health has become “the American way” and needs to stop on all fronts…imho. Whether it’s marketing intentionally harmful goods or sneaking them in on the sly to avoid waste…we’ve all seen both, n’est ce pas? Vigilance. Caveat emptor. Action steps for food safety. And ongoing knowledge acquisition is key. 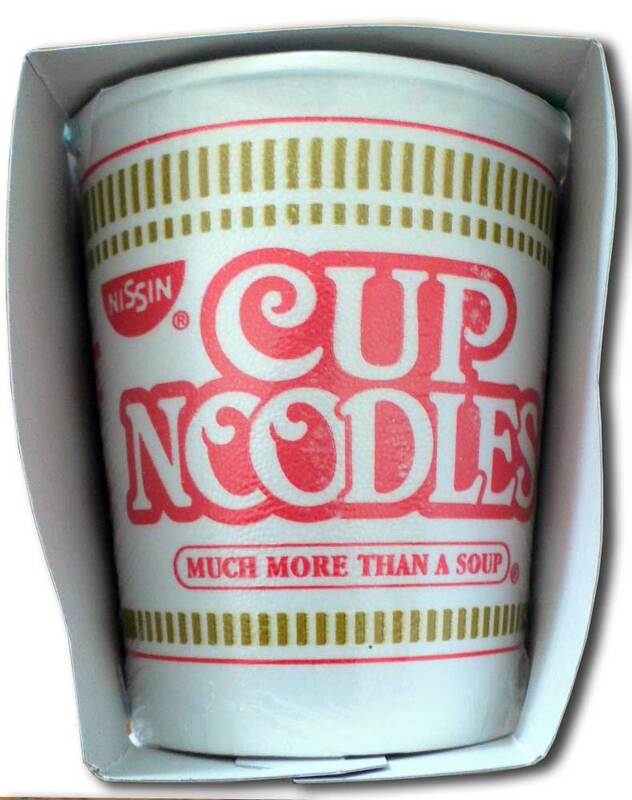 “Q: Every day we hear about more foods from China with melamine. First it was infant formula, now it’s candy in New Zealand, croissants in Japan, M&M’s in South Korea, and coffee drinks in the United States. Explain, please. A: You may be puzzled, but I am appalled that melamine waste from Chinese plastic dinnerware is in so many foods, particularly infant formula. China admits to 54,000 cases, 14,000 hospitalizations and four deaths from kidney stones among infants fed formula laced with melamine. These numbers are undoubtedly underestimates. Melamine is in milk powder for only one reason: greed. You can dilute milk and cover up the dilution by adding melamine. The test for protein in foods looks for nitrogen. Melamine is 67 percent nitrogen (the rest is carbon and hydrogen). Nitrogen is used to make protein and shows up as protein on tests. You can get away with substituting melamine for protein unless food safety officials are checking for it. Clearly, they were not. They should have been. Milk adulteration has a long history and melamine has been fraudulently added to animal feed for at least 40 years. Most people never heard of melamine until last year’s pet food recall of 60 million cans and pouches. These contained an ingredient that caused kidney disease in cats and dogs. That ingredient turned out to be wheat flour laced with melamine. Some Chinese suppliers sold that adulterant in the guise of wheat and rice glutens. In researching my latest book, “Pet Food Politics,” I traced the history of melamine adulteration back to the 1960s when veterinarians in South Africa tried to use the chemical as a source of nitrogen for sheep. They thought that bacteria in the rumens of sheep could convert melamine nitrogen to body proteins. They were wrong. Melamine formed kidney crystals and killed the sheep. That finding did not stop unscrupulous producers from adding melamine to animal feed. This practice was so common in the 1970s that Italian scientists invented a test to look for “melammina” in fish feed. They found melamine in nearly 60 percent of the tested samples. As demonstrated by scientists at UC Davis, melamine itself is not particularly toxic to cats. But when it is mixed with one of its by-products, cyanuric acid, it forms crystals in kidneys at very low doses. It does so in infants, too. Melamine is a perfect adulterant. It is cheap and hard to detect. Remember Melmac dishes? These were so popular in the 1950s that you can still buy them on eBay. Most melamine dinnerware is now made in China. The process involves heat and formaldehyde and yields wastewater heavy with melamine and its by-products. To recycle the water, these chemicals must be removed. The resulting “scrap” is produced in prodigious amounts and is there for the taking. My guess is that unscrupulous Chinese producers have been adulterating foods with melamine for years, but the booming dairy industry provides a new opportunity. Milk is expensive. You can buy melamine scrap for practically nothing, substitute it for the proteins in foods – wheat gluten in pet food and milk in infant formulas – and sell these foods at the price of the real thing. That substitution is unlikely to be detected – unless you add so much melamine that pets or infants get sick. Let’s not, however, get too xenophobic about China. What’s happening there today is exactly like what happened in the United States during those heady late 19th century years of unregulated rapid industrialization and unbridled capitalism. Checks on rampant food adulteration only became possible after Upton Sinclair’s book, “The Jungle,” induced Congress to pass food and drug laws in 1906. The remedy is clear. Countries need to clean up their food safety programs. The challenge facing China is that 80 percent of its food is produced by small countryside operations. It must enact and enforce food safety regulations that apply to that system. We need to do everything we can to expedite such regulations. On our side, this means no-nonsense inspections, import refusals and trade agreements with tight safety provisions. It also means urging Congress to give the Food and Drug Administration resources adequate to do this job or, as some forward-thinking members have suggested, create a new food safety agency with the authority and resources to oversee the food supply from farm to table. While waiting for all this to happen, we have some choices. For the moment, it’s best to just say no to imported foods and ingredients supposedly made with milk or soy powder, unless they are certified free of melamine and other toxic contaminants. But for this, it helps to know where foods and ingredients come from. As of September, Congress requires country-of-origin labeling (COOL) for many foods. Unfortunately, COOL has loopholes entire container ships could sail through. If you can’t find or don’t believe the origin of the foods you buy, ask. Let the stores, product manufacturers and your congressional representatives know that you care about where your food comes from. Tell them that you consider origin labels essential for protecting your family against unsafe food. I gave “Pet Food Politics” the subtitle “The Chihuahua in the Coal Mine” for good reason. Untold numbers of cats and dogs died last year from melamine poisoning. Their deaths should have warned governments to check for melamine in other foods and to enact and enforce more effective food safety regulations. We – and the Chinese – deserve better food safety oversight. In this era of food globalization, all countries need safety regulations more than ever. Marion Nestle is the Paulette Goddard professor in the department of nutrition, food studies and public health at New York University. Her newest book, “Pet Food Politics” (University of California Press, 2008), is about the 2007 pet food recall. She is also the author of “Food Politics,” “Safe Food” and “What to Eat.” E-mail her at [email protected], and read her previous columns at sfgate.com/food. Thank you for expanding on my post. I also noticed some of the things you pointed to. I’ll add another thing to consider. Aspartame breaks down to formaldehyde to methanol to formic acid in the body. returns as ingredients in plywood glue. This glue dries wet and thus can’t be stored. I don’t know enough about chemistry to know if this could be a factor. But it seems the FDA sets an acceptable level for everything without considering interactions. I wonder if a product could be made of almost all poisons, contaminations and approved by the FDA. That would make headlines, not to actually sell the product but to make a point. A product approved by the FDA that can’t be dumped at the landfill. There are acceptable levels for hair, urea, stool,…and on and on..
One point not being contended is that if you take a healthy population in another country and feed them a western diet they will start to develop health problems none existent before the diet change. Here is a good melamine video with information links. Abram: All I know is you’re giving me some great counter-marketing material for our kids’ sessions in terms of visuals that ‘stick,’ and elicit the almighty ‘eewwwww’ to question what goes into their bodies and to raise awareness on assumption about consumption! One year we deconstructed the cochineal dyes (from squished cockroaches) used in bright yogurts and such in order to be legally called ‘natural’ (e.g. the red you see in Campari, etc.) and it was a definite ‘wow’ tool for dramatization. Now I’ll look into aspartame more…as I’ve been needing some good soda chem-cuisine data. –A. Thank you for taking the time to create and maintain this blog. It makes me glad to know that people like you take the time to educate others. This subject matter is one of the most controversial to hit the blogosphere, as it should be. It is interesting that your main focus is dealing with kidney stones. After reading many articles about kidney stones in children it is obvious to see that the issue of sodium content in foods needs to be addressed. Your comment, “To be fair, moderate amounts of sodium are NEEDED to balance water and minerals and help muscles and nerves work properly, but when fast foods, snack foods, and highly processed foods (canned, frozen, boxed, or bagged) become kids’ major intake instead of fresh, whole foods, sodium is bound to bump up to high levels WITHOUT adding a hydration fluid packed with same into the marketing mix,” does seem like it would be rocket science. If that is the case, why do you feel that parents are continuing to serve many of these foods as a major source? Recently, the Smart Choices Program was introduced to the public. For those not familiar, it is a program that is being adopted by many leading food companies, however, not regulated by the FDA. The statistics on the smartchoices.com website state the sodium intake requirement is less than 480mg per serving. For example if a child’s lunch were to include a smart choices portion controlled bag of chips that contains 380mg, plus a turkey and cheese sandwich, an apple and a juice box, do you feel this would be a decent lunch in terms of sodium content? Given there are at least three meals a day? Given the facts you presented about incorporating balance into a diet as well as what the daily sodium a child requires is, do you feel this non-FDA approved program is a real well developed food regulation or a well positioned marketing campaign? I enjoyed reading this post and believe that due to your vast knowledge, you might have some great insight into these major food regulating and/or marketing questions. I want to clarify your mention of chips. Most potato chips have 180 mg sodium per serving or less. Actually, it is one of the lower salt processed foods. Not saying everyone should eat a bag of chips a day. But so many times people have an “all or nothing” attitude and point out the wrong “culprits”. Also frozen veggies usually have low or no sodium – unless a seasoning packet is added. Frozen veggies – and sometime canned (there are low salt options) can be an economical way to get good nutrition (fiber, vitamins). I have a blog post on food processing. Another word about salt intake. 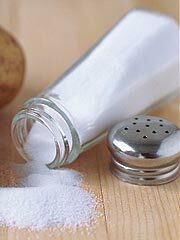 People with high blood pressure, people taking blood pressure medications, or people with heart disease (previous heart attack, on a cardiac diet), and people with kidney disease not on dialysis may need a salt restriction — and the amount restricted is variable, but sometimes it is 2g sodium per day – or 2,000mg. This is not far off from the recommended limit of 2,400mg/day for healthy adults. Even in the hospital I worked in there were patients on a 4 g/day salt diet – 4,000mg and that is considered a restriction! By all means, a healthy person should follow the guidelines of 2,400mg a day to support heart health and maintain blood pressure. But the fact is that our bodies can handle salt. We excrete excess. Many chefs praise the ability of salt to add flavor depths to fresh, whole foods. Actually, it is weight, rather than salt, that contributes significantly to high blood pressure. I hope that clears up some misconceptions. As far as the smart choices program goes. I know very little about it. 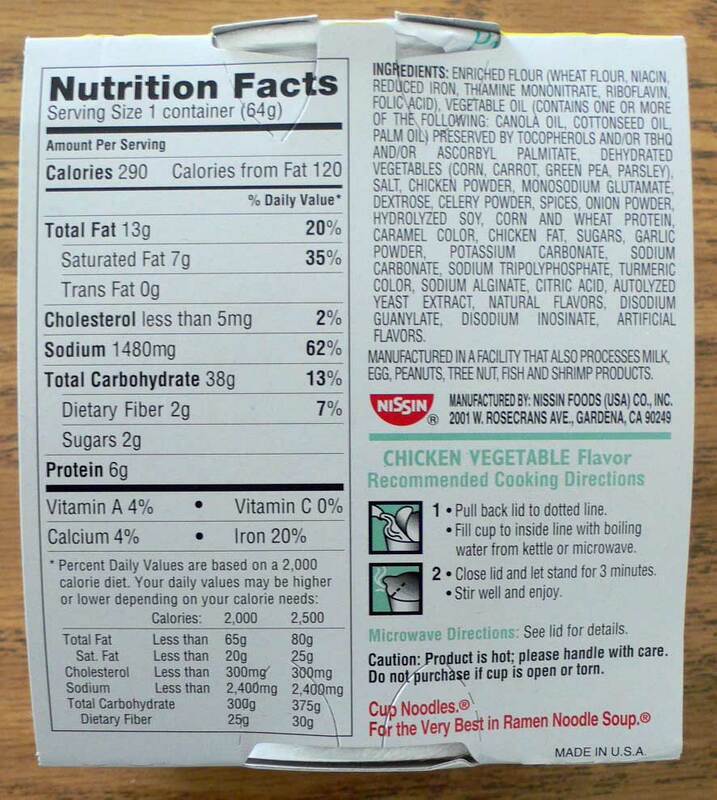 However, my hunch is that it is a way for food companies to follow one set of standards to provide “front of package” labeling of healthy food. This is a way for the industry to self-regulate to try to avoid government regulation. 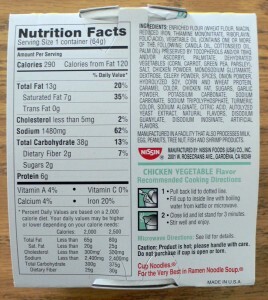 The different front-of-package nutrition marketing symbols have been under serious scrutiny. There is a benefit to self regulation. Government regulation costs money. Do we want limited FDA dollars and resources go toward unified standards for front of package marketing or protecting the food supply from contamination? I also think the best thing parents can do is realize that the only symbol that means something on the package is the pyramid/nutrition facts. If sales of the labeled foods decrease they’ll go off the market. Parents do want an easy way of choosing packaged foods, which is what helped spark all of this. Some of the labeling is useful. I see bean soup with a 14g fiber symbol on the front and I know it’s a good choice… but it is more about understanding that a high fiber diet is needed for good health. Make sense? I personally like to make homemade baked sweet potato chips and regular chips. Just slice ’em thin spritz with olive oil and sprinkle with a little salt and bake at 400 for about 20 minutes. You can do fries the same way, but try using garlic, parsley and feta cheese with the fries. Thanks, Rebecca, for your RD professional take on this…and yes, I invite ALL to field nutrition questions HER way rather than mine, as I just noted on Jamie’s blog (above) that I’m just the marketing/branding geek. That said, I will say that industry ‘self-regulation’ may be worthy in theory, but we differ a bit in that I strongly believe that corporate competition will ALWAYS find a way to self-position ahead of the pack, which means that ANY kind of collaborative system put into play is at risk for a rogue member zinging off into superlative mode. As a mom and a media maven, I’d implore the FDA, FTC and all other regulatory parties to listen, hear and heed the concerns of consumers that are sick and tired of brand confusion and don’t want to have to be spending half our time at the grocery store trying to assess what’s REALLY a ‘smart choice’ or ‘sensible snack’ or whatever by wading through the mice type on the sidebar. This is where a simpler, quantifiable ‘system’ could level the playing field for purchasing power everywhere so that we ‘know at a glance’ what we’re buying without being lured into brandwashing terminology and ‘better for you’ label lingo that’s really hogwash. Thank you so much for responding to my questions and comments. As a music student at USC in Los Angeles, my studies focus mainly on music. However, I have a passion for food, food entertainment and health. This is the reason behind my blog as well as my interest in your organization. It is interesting to see Rebecca’s perspectives on how the FDA should use their funds. I can definitely see that point! However,I find myself really focusing on marketing and advertising.I am both fascinated and disgusted on how manipulating these techniques are. I spend a ridiculous amount of time in the grocery store looking at labels and packaging. Luckily, I am educated in nutrition enough to know what to look for. Again, thank you so much for your input. I will continue to follow both blogs and include them in my research. all about renal failure on the rise, etc. Well kidney stones in children is quite horrible but its not just colas. Powdered milk also has a lot of risk. Say what you want, but without the certainty of lawsuits and large judgments against corporations, companies would still be designing shoddy products that would damage children. Companies only care about the dollar. 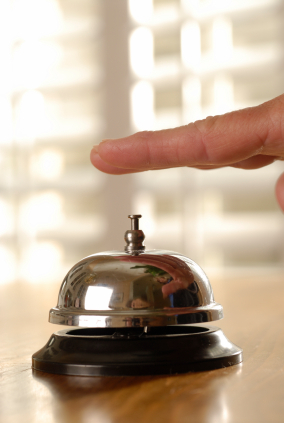 Lawyers and lawsuits play a significant part in keeping citizens safe. Spoken like a true lawyer. 😉 Actually, CSPI (Center for Science in the Public Interest) has proven your point quite well when it comes to many FDA food liability issues and FTC/packaging claims. Thx for taking the time to comment. A complaint that is usual common in adults, affecting kids. Dehydration is one of the biggest causes of kidney stones but a diet high in phospahte drinks like sodas also incresase the risk of calcium phosphate stones. I wonder if this is a combination of the two. 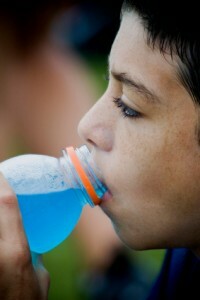 Instead of reaching for a glass or bottle of water, kids are all to quick to reach for the last sports drink! Nowadays Kidney stone has become normal in children. It cannot be just because of powdered milk or anything else, it could be hereditary. Kidney Stone Treatment should be done on time by specialized urologist because the pain due to it can be violent. I would suggest to avoid painkiller in-case of children.